Ficus benghalensis is native to India, Sri Lanka and Pakistan. 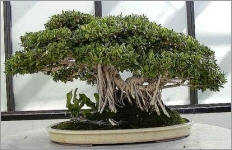 Banyan make beautiful bonsai tree but can also get 100 feet tall and, with its massive limbs supported by prop roots, spread over an area of several acres. As it grows, Banyan produces aerial roots that hang down from horizontal branches and take root where they touch the ground. These vertical "prop roots" can create a forest on their own. The leaves start out bronzy brown and hairy before maturing to glossy green and retaining just a scattering of hairs. The figs are scarlet red, about a half-inch in diameter.